Met service severe weather statement. 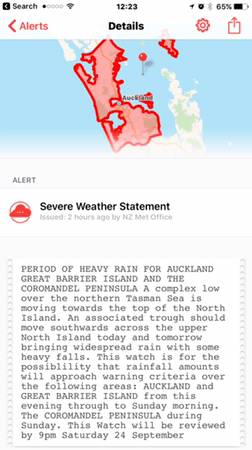 PERIOD OF HEAVY RAIN FOR AUCKLAND GREATBARRIER ISLAND AND THE CORROMANDEL PENINSULA. A complex low over the northern Tasman Sea is moving towards the top of the North Island. An associated trough should move south wards across the upper North Island today and tomorrow bringing wide spread rain with some heavy falls. This watch is for the possibility that rainfall amounts will approach warning criteria over the following areas: AUCKLAND and GREAT BARRIER ISLAND from this evening through to Sunday morning. The COROMANDEL PENINSULA during Sunday. This Watch will be reviewed by 9pm. Saturday.